I say surprising because, as mentioned before, this is a restaurant located in the heart of Albany's strip mall suburbia, basically behind an Advanced Auto Parts (useful as a reminder of where to turn left into the parking lot). Stepping inside, it's easy to quickly forget where exactly you are. 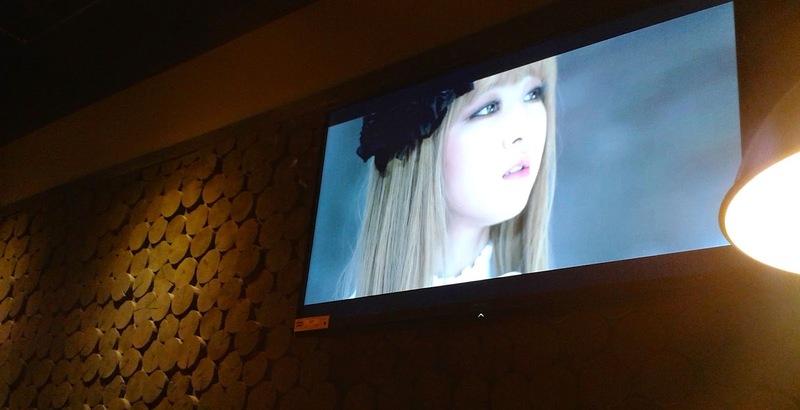 The modern design is a mixture of light-colored woods and shiny metals, featuring a rather spacious seating area and K-Pop videos playing on TVs around the dining area. That's nice, but I'm most interested in the food. 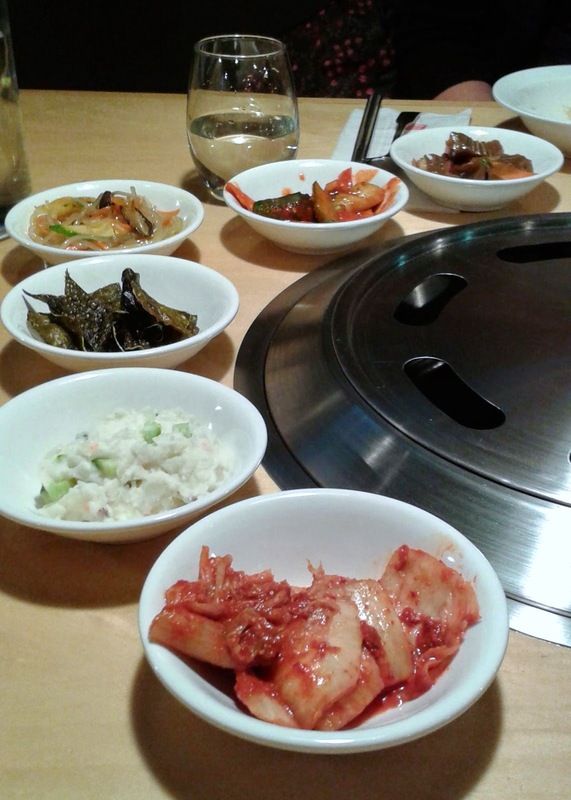 The first questions with a Korean restaurant have to do with banchan: Do they serve it (and how much)? How good is it? Is it unlimited? The answers at Namu: Yes (six small bowls on our first visit, eight on the second), very good, and yes. I don't even know what all these dishes were. There was the familiar kimchi and japchae, but also other tasty plates, like a mashed potato dish (or maybe some other mashed root vegetable), and curious ones, like a white jello-like concoction served with thin slices of fried egg. 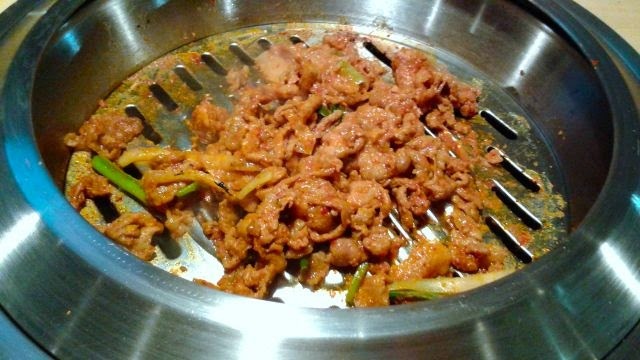 In terms of the menu (which can be found on this page from the Table Hopping blog), there's the Korean barbecue section of the menu, plus many of our non-barbecue Korean favorites, classified as "Stews and Soups," "Rice," "Noodle," and "And More." While we felt we had to try out one of the barbecue dishes, since this is the restaurant's specialty and all the tables are outfitted with the built-in grills, we've found really good dishes all across the menu. For the barbecue dish, we tried the Spicy Pork ($19), which was not terribly spicy. Our server prepared it in the grill at our table for us, and the worst part here was waiting for it to get charred while the smell of the spices and garlic drifted toward us. This isn't the best deal on the menu, as it wasn't a huge portion of pork for the price, but the marinade gave it wonderful pepper and garlic flavor, and I found myself trying to pluck every last charred scallion from the grill. From the "Stone" side of the menu, we've enjoyed a few dishes: the Seafood Jeon ($18), plus the Kimchi Stew ($13) and Spicy Tofu Stew ($14). We'd tried a version of the Seafood Jeon--a wide, seafood-filled pancake--at Seoul in Latham and were most disappointed in the amount of seafood included. 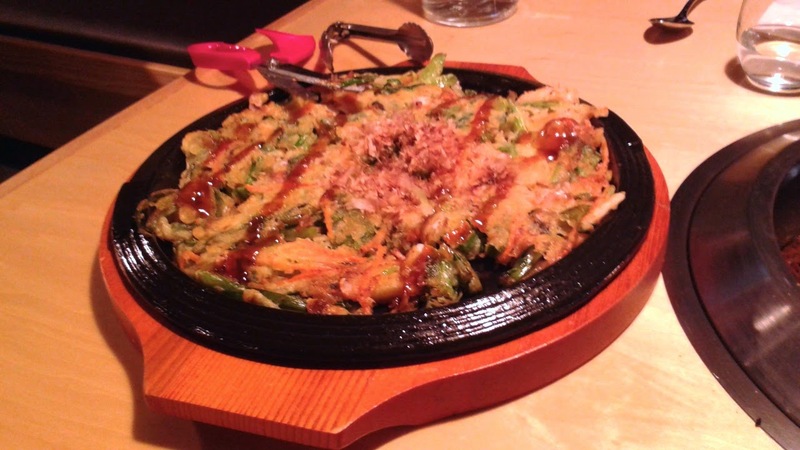 This wasn't a problem at Namu; the pancake was bursting with several types of seafood, most notably shrimp and squid. The flavor was quite good, and only enhanced by the thick, brown, soy-based dipping sauce it was served with. I don't care what season it is--I'm always in the mood for Korean stone-bowl stews. But with the harsh early winter weather we've endured this year, there was no question we were trying some of these stews on our second visit. K went with the Kimchi Stew, while I wanted to try the Spicy Tofu Stew, especially after having this dish last year at the Organic Tofu House in Ridgewood, NJ. K's stew was loaded with kimchi and bits of pork and firm pieces of tofu. The flavor was excellent: sour and full of spice and heat with a bit of that pork flavor in the background. I'm getting my own bowl next time. That's not to say I didn't enjoy mine--it was very good, almost as good, I would say, as the acclaimed version at the Organic Tofu House. It was fun cracking my own egg into the soup in Ridgewood, but flavor-wise I was very satisfied with Namu's version. The heat from the spices was just enough to not be overpowering, while the combination of soft tofu, runny egg, and a variety of seafood was enjoyable. There were mussels, squid tentacles, and a large, unpeeled shrimp hiding under the block of tofu, which was almost creamy in texture. I'm confident in recommending Namu already, which is often not the case with new restaurants in this area. It's been fairly crowded during both of our visits, mostly populated by young Asians, a sign, I take it, that the food here is authentic and good. This is the kind of restaurant I've been longing for in the Capital Region: tasty, fairly-priced ethnic food with a menu diverse enough that I want to keep coming back for more. They even have Kimchi Tacos as part of their $11 lunch menu, the kind of item I associate more with, say, Roy Choi's food truck. But then there's the Galbi Tang--a beef short rib stew "cooked for hours and hours for deepest flavor." I hope all the dishes stand up to the expectations I now have. But for now, I have no problem recommending Namu. And really, just go ahead and plan for multiple visits while you're at it. Looking forward to trying Namu... thanks for the great review. And wonderful to see that you're back! ahhh seriously?! Can't wait to try when I head back next! Thanks, caravan and Innae--I hope you both enjoy it. And Innae, you're going to sit down in there and forget where you are (it sure won't feel like a Colonie strip mall!). This sounds like a crave-worthy new place. Can't wait to try! I was there just after it opened, for lunch only, and was very happy. Glad to know it's holding up. Who wants to have a meet up over the holidays at Namu? Thanks for the review. I'll certainly give them a shot. It would be nice to finally have a good Korean restaurant in Albany for a change. We've eaten there twice and had great meals both times.There haven't been too many other people in there, though. I hope it gets more traffic and stays around for a long time. I've eaten there twice and very happy with everything both times. We really needed the authentic, quality Korean restaurant in our area, and looks like we finally got it! @BMF, good idea to gather people together for a meal at Namu--it would be a great way to get more people in to check this place out. 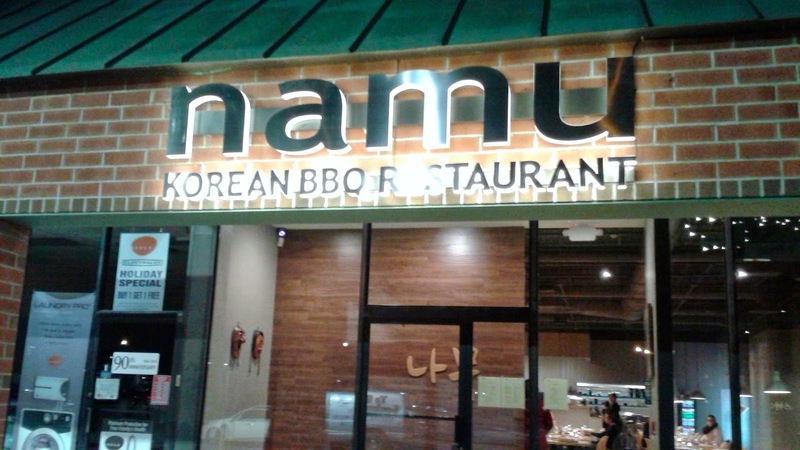 @Chopsticks Optional and Yoon C., I think you guys will definitely be craving lots of things at Namu; I'm looking forward to seeing what you think! @Amy, hopefully you've just been there at quiet times; I've been later in the evening, around 7 or 8, I think, and there was a pretty good crowd for that time. @Chris, you're so right about how we needed a place like this in our area--glad to hear you're liking it a lot, too!